Exterior walls are afflicted with two modern menaces; cement-based pointing and waterproof paints. Both are relatively cheap to apply, make a building look 'smart', but can cause major problems and cost a fortune to remove. Textured exterior paints can hide a multitude of sins, but they also trap damp, and spoil the look of most houses. These comments apply to any paint product (except for lime washes) applied to non-cavity walls, although walls with cavities may experience some of these problems. Porous stone walls are also at risk. The longevity of such walls - and the rest of the building - depends on the breathability of the wall. Many old bricks are porous and if you seal the outer layer, any moisture getting into the bricks - from inside the building, from the ground below, from failures of guttering, or from any cracks in the paint coating, will have no way out. In time the moisture levels will increase, eventually causing staining and other damage to internal decoration, spalling on the outside as the moisture freezes (particularly on exposed areas such as chimneys, or in colder regions), and providing the right conditions for wet and dry rot (the latter actually requires moisture to grow). It is unwise to think that the paint will act as a 100% seal - it will have flaws, and anyway much moisture comes from inside the building. The cost of removal is high - it requires scaffolding and the use of expensive chemicals, and the long-term risks from the use of these caustic chemicals are not really certain. The use of them has to be weighed up against the risks from leaving the paint on! 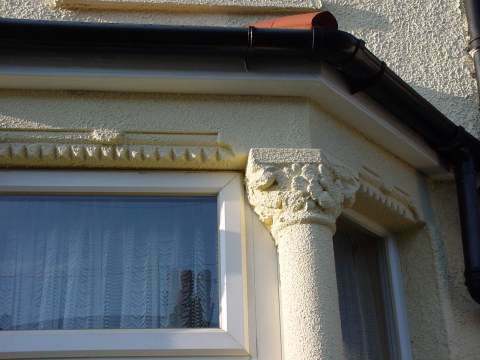 The operators from the exterior paint companies tend to take short cuts - the paint is applied to everything, even the window frames, obscuring the detail on lintels and other stonework. The cosmetic look is "pretty, nice and smart" etc but will require constant refreshing over the years, and spoils the period look of an area. If the reason for painting a house is to hide poor pointing or shabby rendering, then either repoint (with a lime/sand mix and to the original style - typically flush, not weather-struck), re-render (again with a lime/sand mix), or else use a lime-wash or lime-based paint. If your house is already painted, what are your options? The counsel of perfection is to leave exterior wall paint to erode naturally; the effect of rain, frost and wind will in most climates be a gentle process and cause no collateral damage. In practice, this will take some years and during this time there is a higher risk of other problems. A balanced objective is to minimise the risk of damage - from the product and the removal process, to restore to the original appearance, and yet to preserve the aged appearance. For example, if we remove the paint, we must do so in the most careful manner, and avoid damage to the bricks. When shabby, cracked, flaking or peeling, you can remove any loose paint, and repaint. If the long-term plan is to remove the paint, use a lime wash to fill these gaps.